In the Lunch Time with Mr.INOUE(Executive Managing Director) from Japanese Chamber of Commerce, Bangkok. I`m little bit nervous, because first time met to him. But he is very friendly! I feel so happy! Before we have big support for memorial service from Japanese Chamber of Commerce, Bangkok. Of course, We can no`t say “please help for us again”. Because we have long time from TSUNAMI disaster. We are not same, But we will activity continue in Thailand. I hope to keep good communication and relationship too. Right: Mr. Tsuyoshi Inoue(Executive Managing Director) from Japanese Chamber of Commerce, Bangkok. Afternoon first, We visited at NHK General Bureau for Asia. Mr.FUJISHITA, He have been TSUNAMI disaster 2004 in Banda Aceh! So, He know destroyed city. We explained about change day of memorial service at 5/Nov and hope help us something. Still not fix about event of Memorial service, Something event From ISHINOMAKI that is get damage of TSUNAMI disaster. 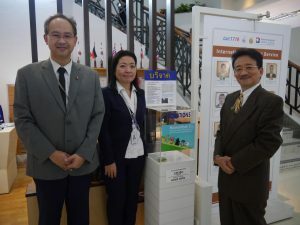 Also, From Phuket will make something event for ISHINOMAKI too. Thailand and JAPAN, Such us good communicated. This is we PLAJA hope it. We want to say “very Thank you” for Mr.FUJISHITA. Shop with Original T-shirt again! And Today`s Last at AJINOMOTO. AJINOMOTO was big support for us. Memorial service, Kid`s Day Event, etc. But Mr.KURASHIMA(President) was not in office. I give to PLAJA`s Brochure and Original T-shirt and today`s our activity was end.